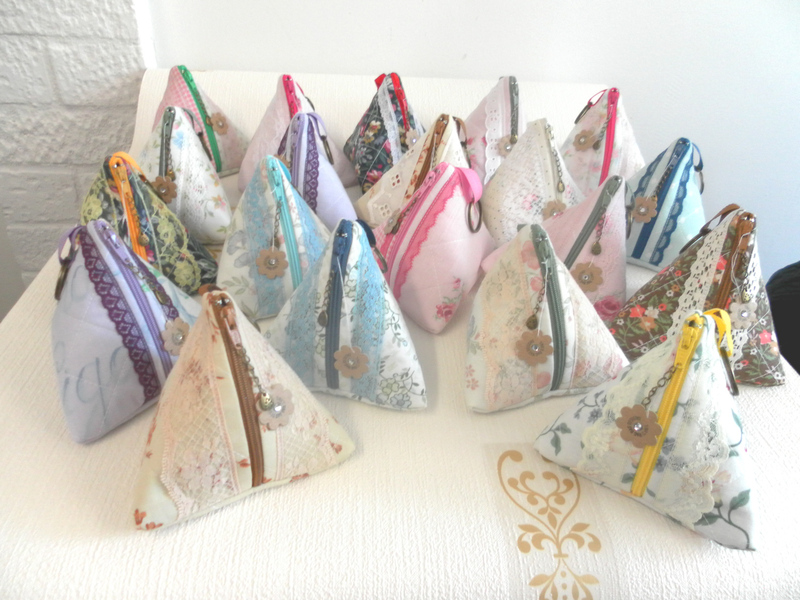 Had a lovely few days making these little, lined, coin pouches, I have 30 ready now. All of these are made with recycled fabric which I have quilted (yes I am still hooked on my perfect diy quilted fabric). They are lined, and decorated with lace, a loop on the back with keyring, and zip chain with little ‘recycled’ emblem charm. 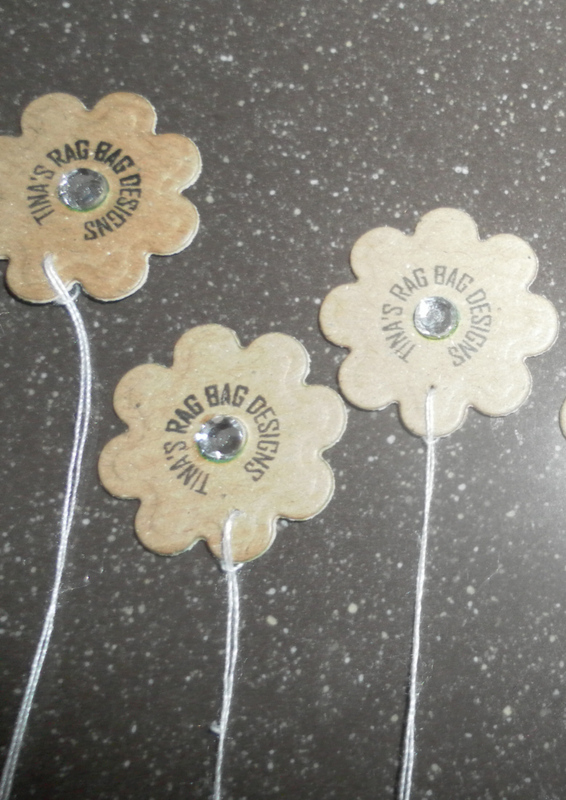 Today I was busy putting the finishing touches to them and adding my little labels ready for sale! 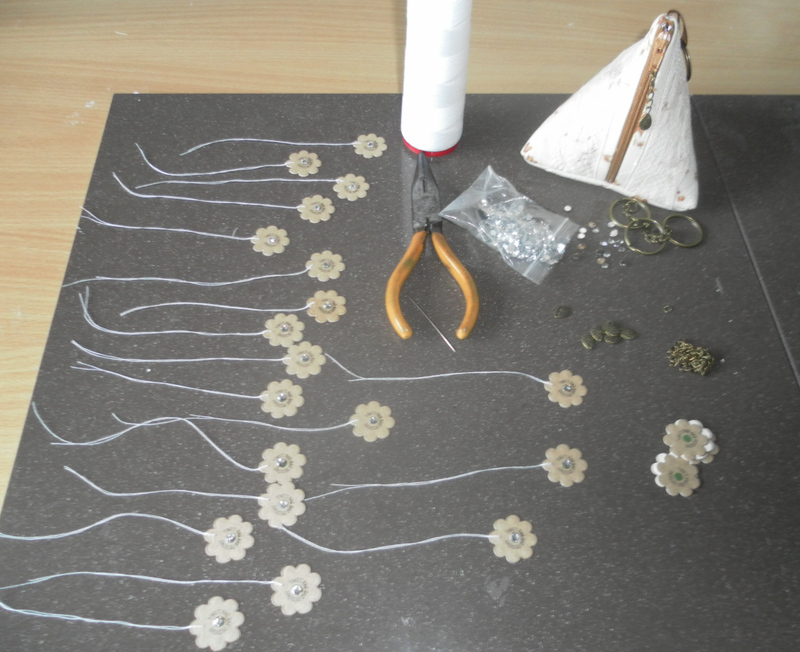 Here are some of the tools for finishing off, chains, charms, keyrings and my own little handmade labels. My labels are made from cat food boxes and Kraft paper. I just printed my logo on the Kraft paper, stuck it onto some card from the cat food boxes then put it through my Big Shot using a little flower die. I have stuck a little gem in the centre to add some sparkle. Then tied the label to a purse with cotton. Easy! 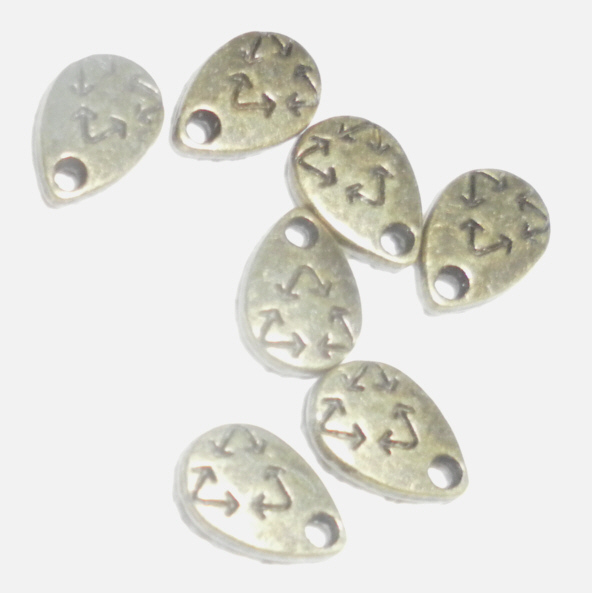 Here is a close up of the little charms I purchased to put on the end of the zip pulls. The logo is supposed to represent recycling. The chain, charm and keyring on each purse is antique bronze colour. 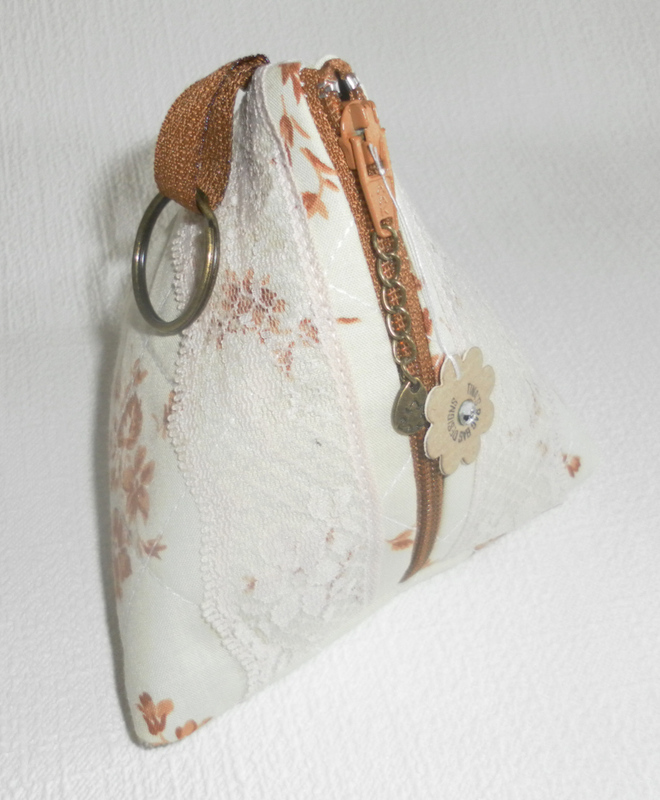 These make sweet little coin purses, and are squishy enough to put into any handbag. I’m looking forward to making lots more of these and hope that other people will like them too as I will be doing another Christmas craft fair this year and these will be the main part of the stall. I was relying on my friend to take me to the fairs as I don’t drive. Unfortunately she moved away some time ago, so now I am having to think of things that will be small enough for me to carry on the bus!!! Its surprising how many of these I can get into one of my laundry bags…………………. I do sell them in my Etsy shop but postage is quite expensive. It does take a while to master this, don’t give up, after all you will only be wasting old newspapers whilst you practice. In the video she uses white glue (PVA glue), I use a glue stick which works just the same but dries quicker. And I cut my newspaper with scissors. 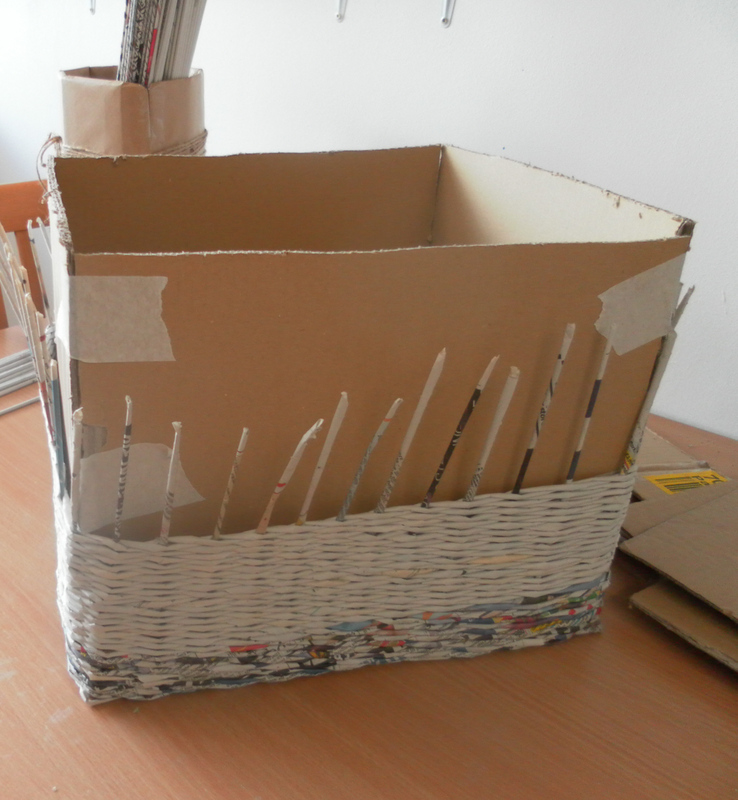 Measure the size of basket you want to weave and make a mock up, or mould, of one out of cardboard. Make the mould approx 1″ smaller than the size you want your finished basket to be. 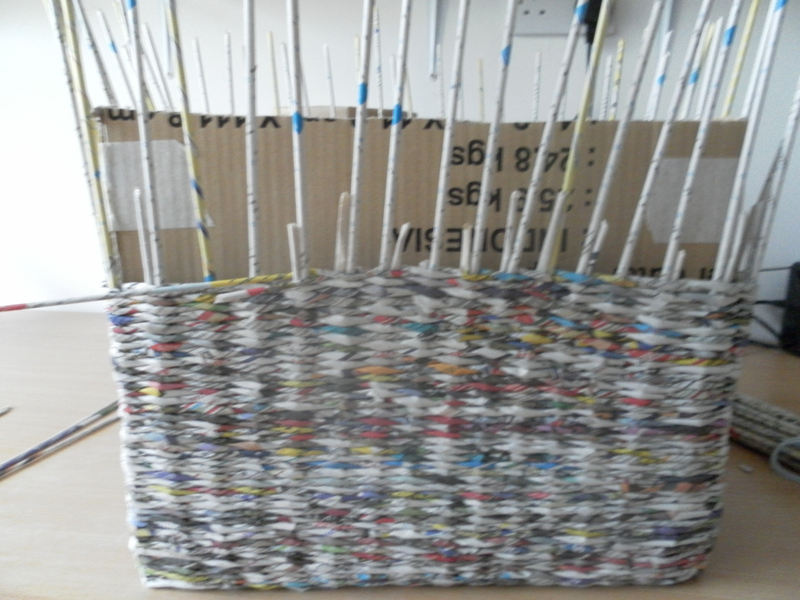 You will use this to weave round, it will help you to keep the size and shape of your basket as you will see further on in this tutorial. 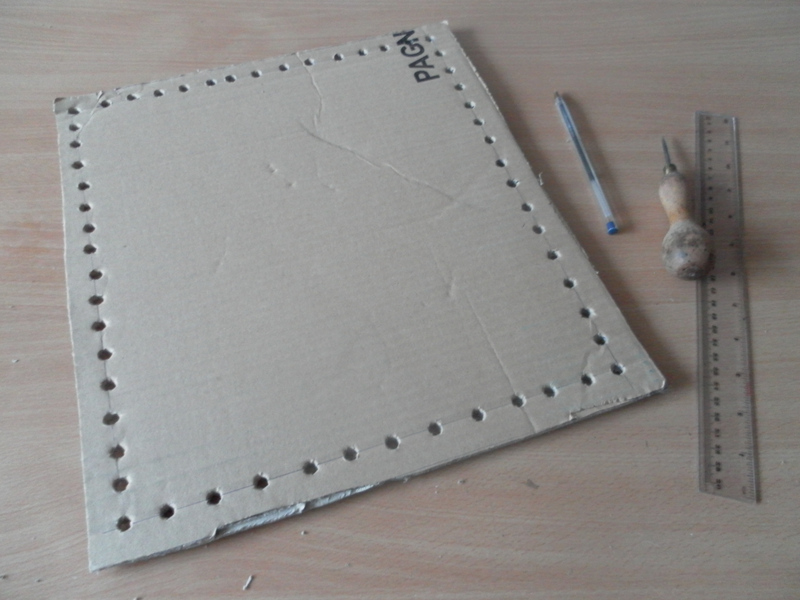 Using your mould as a template draw round the bottom onto another piece of cardboard. 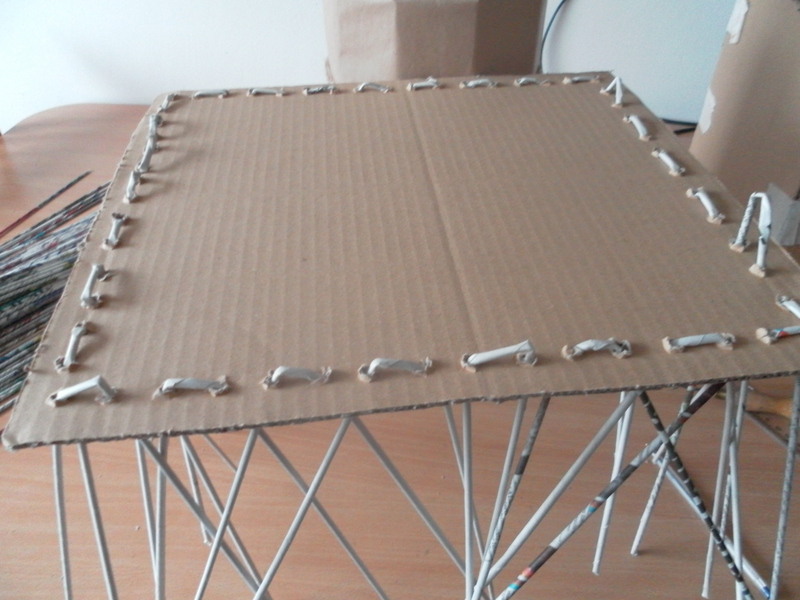 ( I have used a thick piece of cardboard from a flat pack furniture delivery box, you could glue together several pieces of thin cardboard to make it thicker). This piece will be the beginning of your basket. Now to start making your basket. (Mine is quite large 15″ x 15″ x 12″ deep but you can use this tutorial for any size you want). Draw a line on all four sides of the piece of cardboard you have just cut out for the bottom of your basket, approx 1/2″ in from the edge. Measure and mark approx 1″ apart along each edge making sure to mark at each corner. Don’t be too worried about this measurement as long as they are evenly distributed along each edge. Next, using a screwdriver or something similar, push through each mark you have made making a hole large enough to take a newspaper stick. 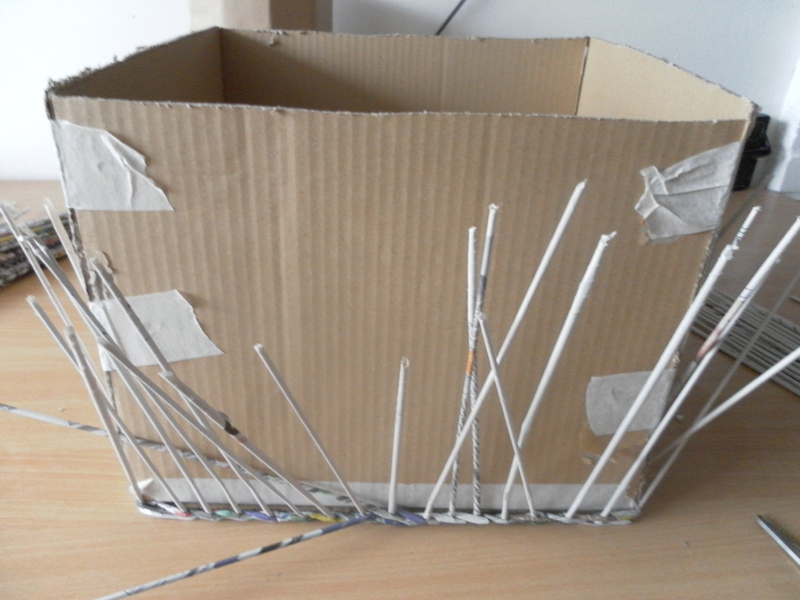 I started with an awl and then pushed a biro through each hole to enlarge it. Take a newspaper stick, fold it in half and poke one end through one of the holes, with the other end of the newspaper stick poke it through the next hole. Pull it through tight so the loop lies flat, as in the picture below. 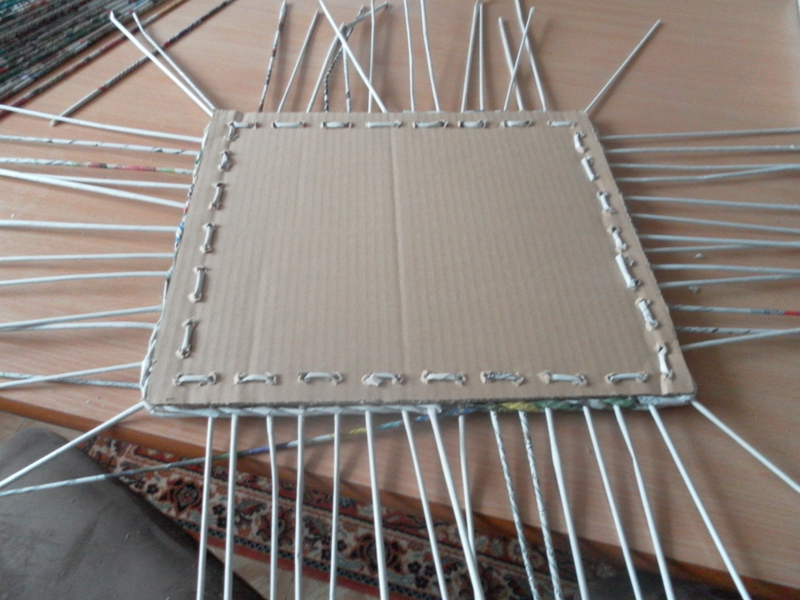 Keep adding sticks until each hole has been filled. Turn the cardboard bottom over and these will be the sticks that you will be weaving on, the uprights. 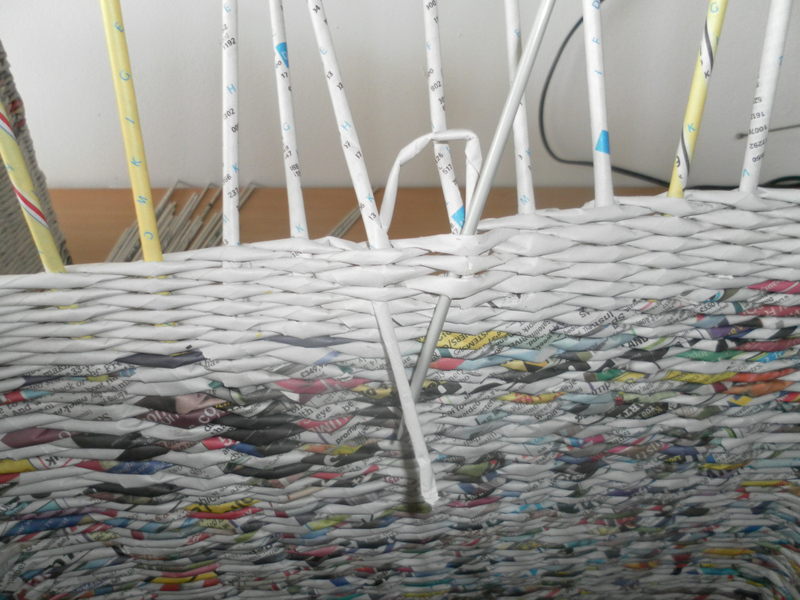 For my basket I use the rope weave, which uses two newspaper sticks at a time. this video shows you how to make a different bottom, but also shows, very simply, how to do the rope weave. Weave one row all around the outside of the bottom piece of cardboard. 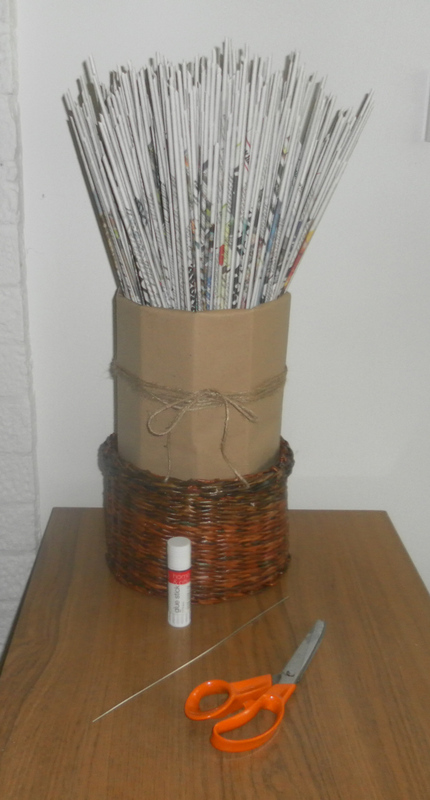 Making sure you mould the weaving newspaper sticks round each corner. When you come to the end of the second row take your mould and place it inside of the upright newspaper sticks. Make sure all of your uprights are on the outside of your mould. 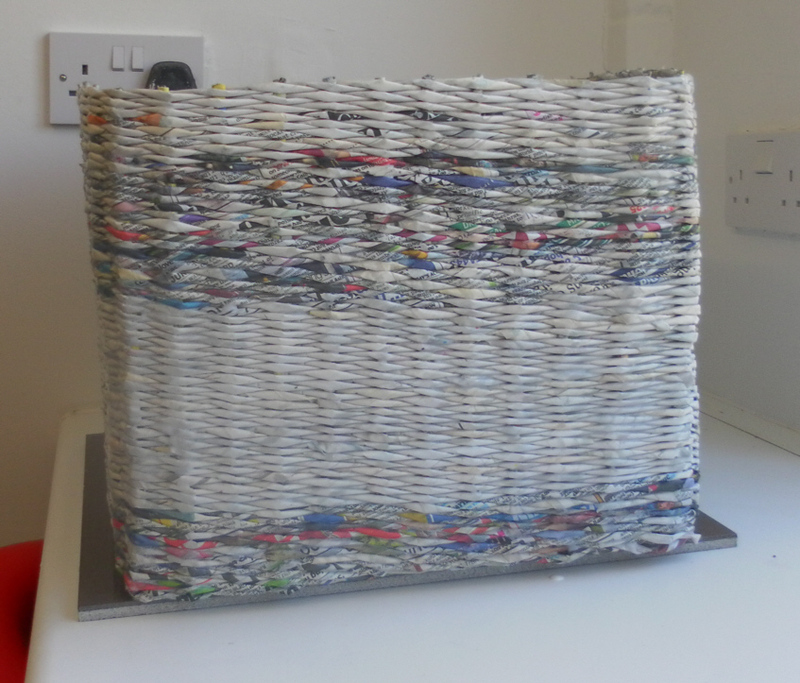 I like to put something heavy inside the mould so that it doesn’t move around whilst I am weaving. I have used a couple of full paint tins but you could use anything like tins from the food cupboard, stones or bricks from the garden etc. 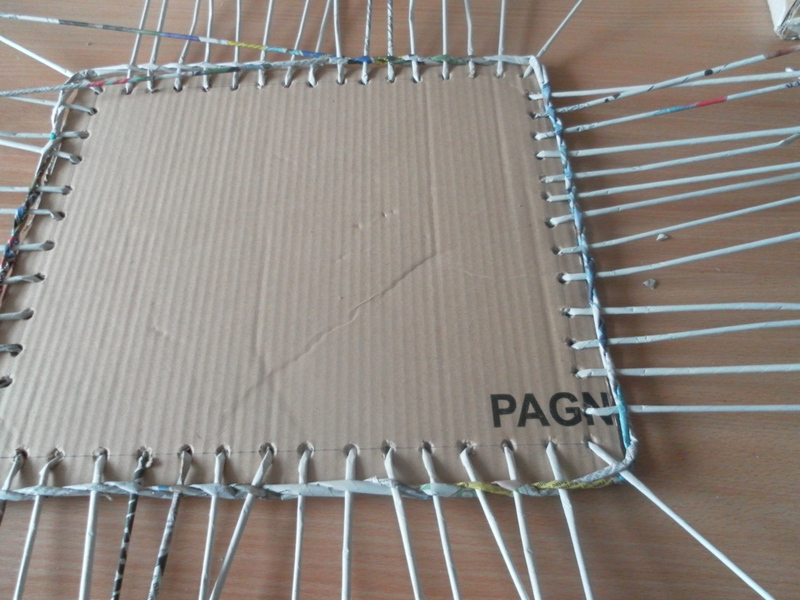 Now you can carry on weaving, making your weaving as close as possible to your mould. But not too tight that you can’t remove your mould at the end. 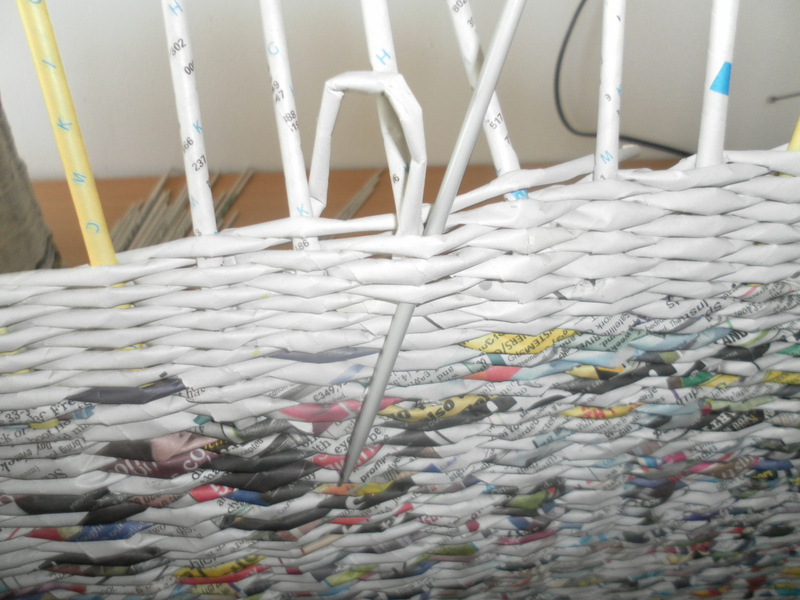 If you find your uprights are too short for the height of your basket, as I have here, you need to make them longer. 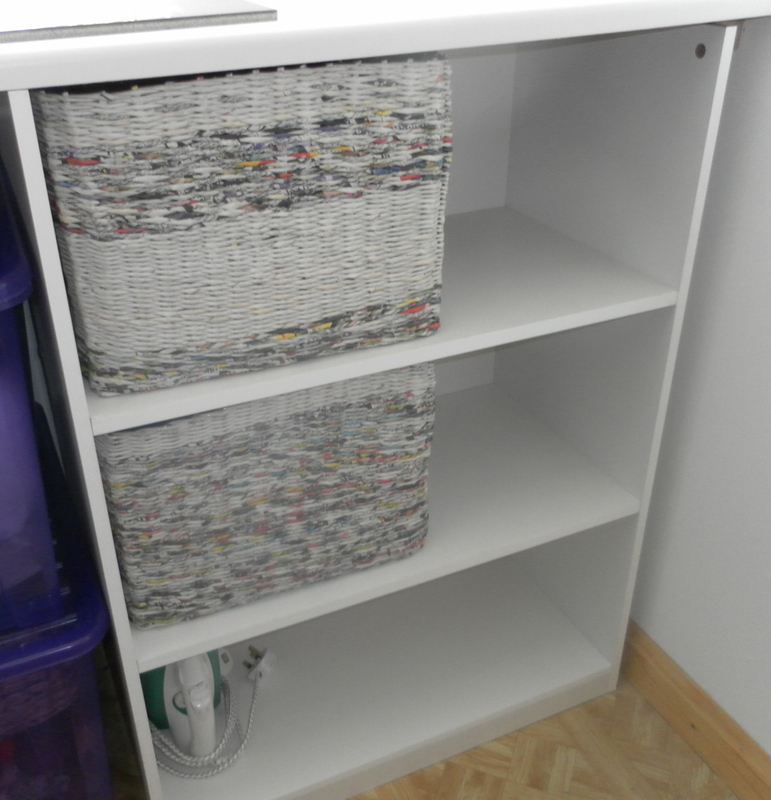 To do this you need to add more newspaper sticks. 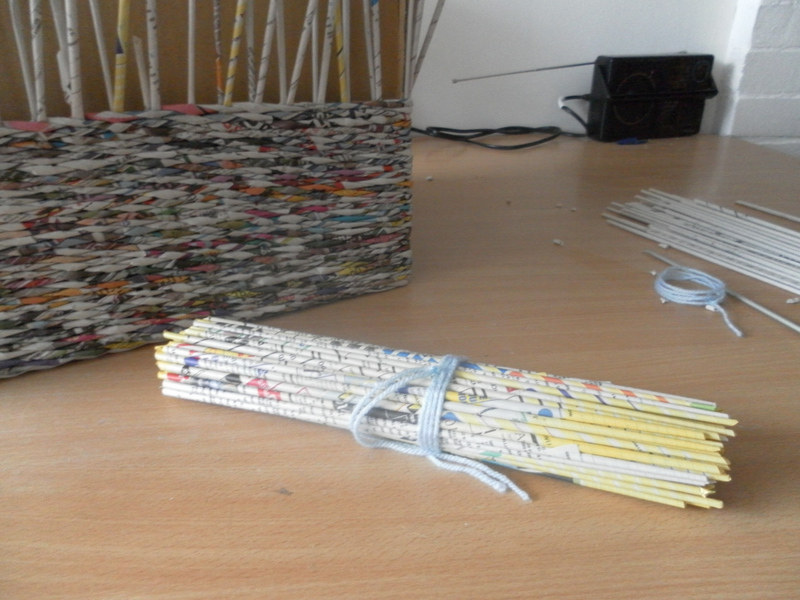 Here I have some made from the yellow pages, they are shorter than the newspaper sticks but long enough to reach the top of my measured basket. 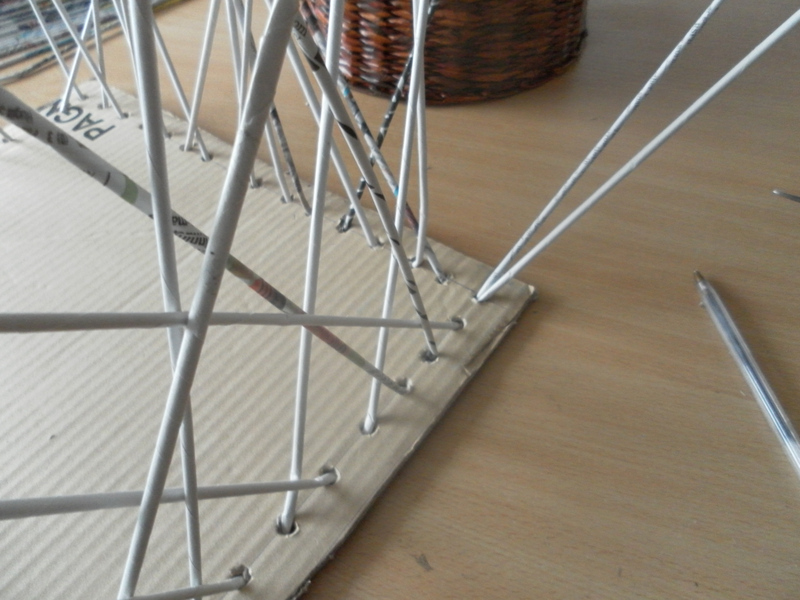 To make the uprights longer I insert more paper sticks, with the use of a knitting needle. 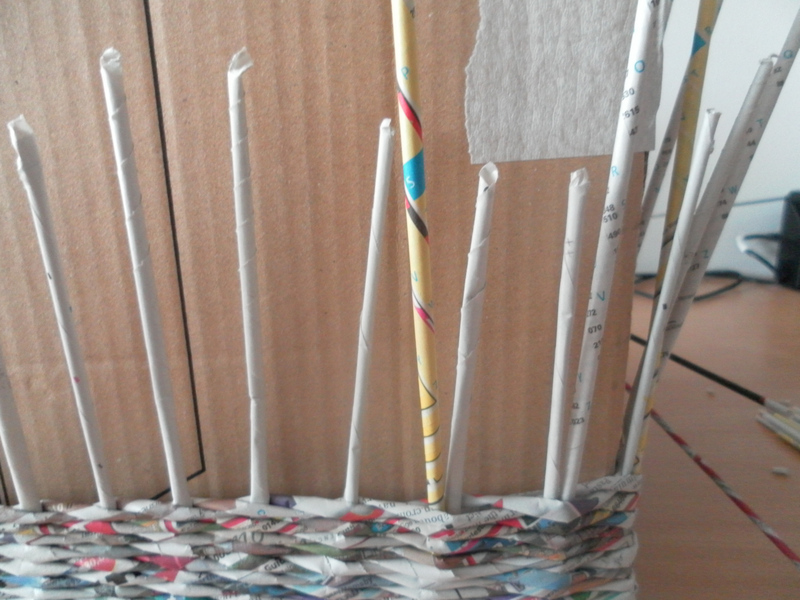 Poke in the knitting needle next to one upright and slightly stretch the weaving and just push in another stick (you could add a small amount of white glue (PVA) if you wish). You will need to add new sticks all the way round. Be careful not to pull out these extra sticks as you are weaving. Carry on weaving incorporating these new sticks as shown. 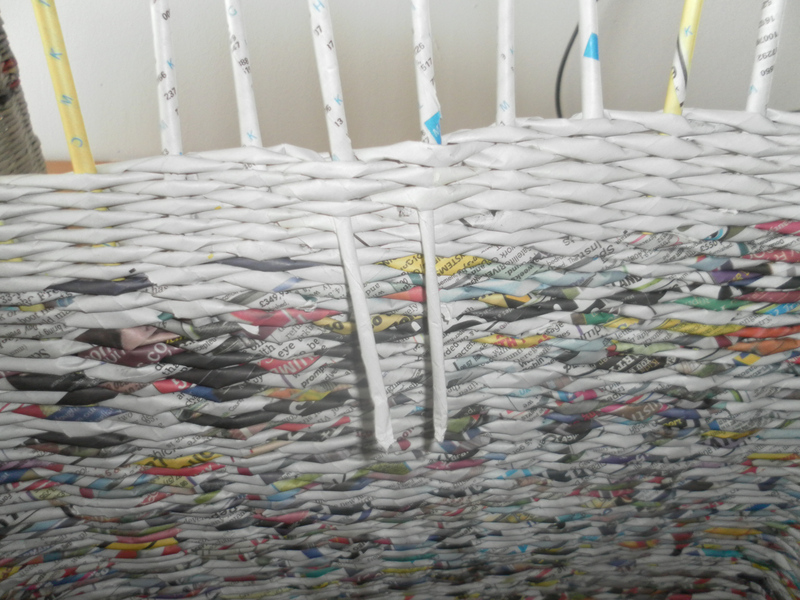 When you have reached the height that you want your basket to be you need to close your weaving. Take each end of your two weaving sticks and using a knitting needle or similar, prize open about three rows down and push down one end, pulling it right through, do the same with the other end. So they look like this. Cut off the excess. 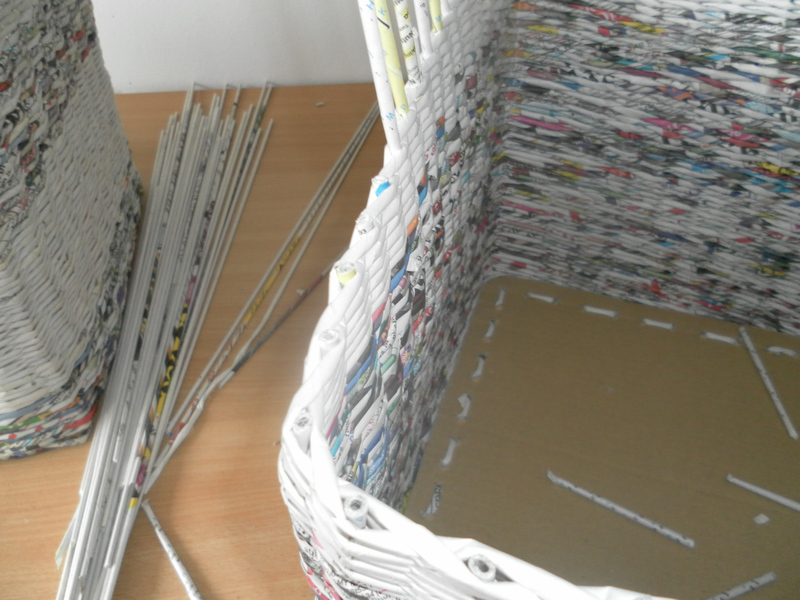 In the next tutorial I will show you how I finish and paint my newspaper weave baskets. I have a lovely wall unit in my studio with lots of shelves, I also have loads of cottons, tools, papers, things I have made, the list goes on. So I decided I needed storage boxes to fit on the shelves of the wall unit. Stupid idea, I spent hours looking through Argos catalogues, internet and ebay for ones that would fit. I had measured all the shelves in inches, all the boxes advertised were in either cms, or mm or even litres!!!! In the end I decided that it would be quicker to make my own. So I am. The only trouble is it involves paper mache, and that is taking sooooo much time. I hope they finish up how I imagine they should. 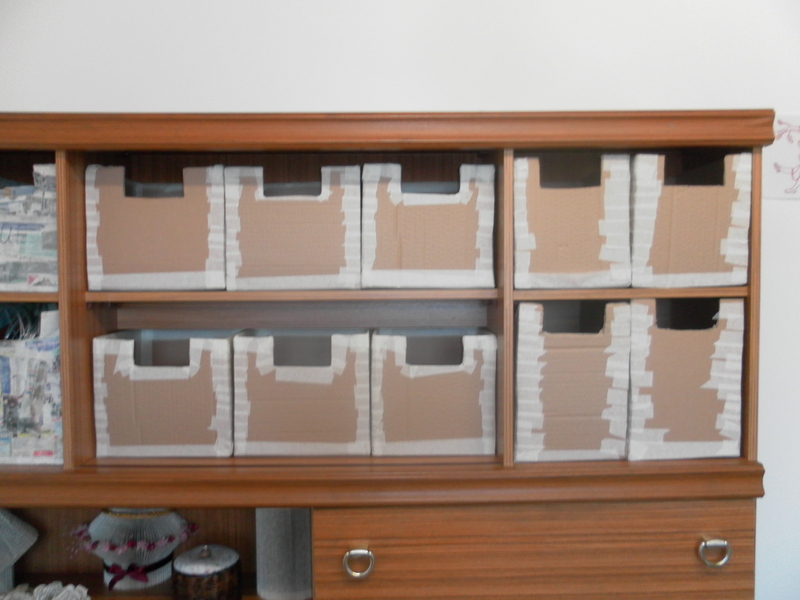 I made these boxes up in a day, using recycled cardboard and masking tape. I have spent the last couple of days covering them with kraft paper mache. It is taking 2 hours to cover the inside and outside of one box. Such a long winded job, but it makes the cardboard sturdy. Hopefully I will finish covering them soon, then I can start painting them. These are going to give me so much more storage space, and as I am going to label (craftily) each box, more organised too. And they haven’t cost me much except a roll of Kraft paper from ebay. 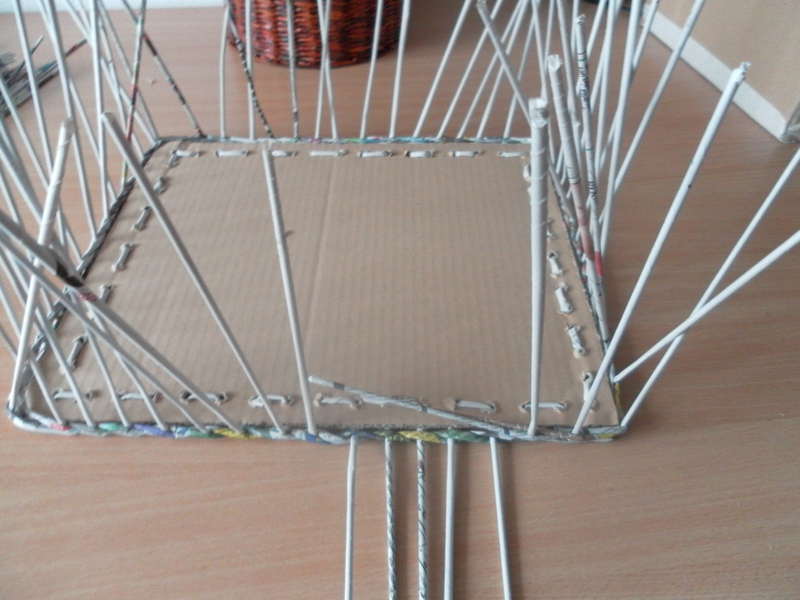 I will post pictures of the paper mache stage when I have eventually finished it!